Josiah Black has been many things, from outlaw to sheriff and from husband to widower. As a hired gun he takes on the task of tracking down and killing a murderer, but in doing so gets drawn into a world that he believed only existed in folk tales, adding ‘monster hunter’ to his list. As time, and the tale, progresses however he begins to doubt what he is doing. Is he being manipulated ? Are they really monsters that he is hunting and killing, or is he himself the only monster ? WesterNoir has been described as ‘Deadwood’ meets ‘They Live’. Former sheriff Josiah Black wanders the landscape of the old West, doing his level best to lose himself in its barren deserts, isolated settlements, and desolate mining towns. When his past haunts his thoughts, the liberal application of whiskey only dulls, never relieves, the pain of personal loss and tragedy. His life takes an unexpected turn when he’s approached by Greta Anderson, a “woman with dead eyes”, who has a simple request: track down Jim Wilson, the man who slaughtered her family, and leave him dead in the dirt. When Wilson’s trail leads Black to the home of the Plunkett family, a poor clan of homesteaders with a good reputation in the community, this drifter turned bounty hunter finds that seeing is only believing when you have the tools to cut through the wool and reveal the wolf hidden beneath. Like many people, particularly of my generation and older, the classic Western is a genre that will always hold a place in their collective hearts- and on my movie shelf. I’ve read Louis Lamoure, seen all of the Clint Eastwood classics (The Outlaw Josey Wales being my personal favorite), and hold the more recent Silverado as an outstanding salute to the classic cinematic genre. I even count Quigley Down Under as a great Western movie, even though Australia might be a little farther west than is generally considered. A good Western is more about the attitude than the longitude. Then at one point, I discovered an offshoot of the genre, The Weird West. If you’re not familiar with the term, it’s a bizarre & gritty blending of the Western tale with fantasy- usually dark. Examples of the Weird West genre can be found in the old pages of Jonah Hex, on the television series The Wild, Wild West (although it’s often thought of as more steampunk than anything else), and notably in the Oni Press epic, The Sixth Gun by Cullen Bunn & Brian Hurt. The mix of storytelling styles works particularly well, considering the superstitious nature many of the western settlers held toward the world around them. Add the beliefs and lore of the Native Americans, and there’s more than enough source material to bring something different to the “thrilling tales of yesteryear”. 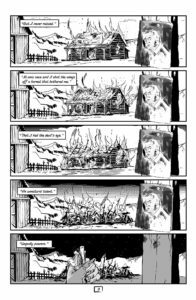 Now publisher Accent UK Comics tosses another very cool entry into the mix. This past weekend at C2E2, I met British writer Dave West, and knew right off the bat that he wasn’t from ‘round these parts. 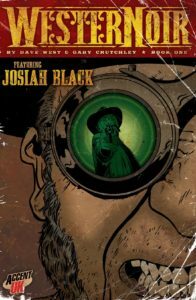 He was happy to introduce me to the WesterNoir anthology (co-written by himself and artist Gary Crutchley), and chat a bit about what went into the dark and twisted story of Josiah Black. Honestly, he had me at crocodile people but when he said he’d throw in an original sketch card by Crutchley, I couldn’t walk away without this book. It might seem a little odd, a British gentleman writing about the American old west, but if you think about the origins shared by many of our forefathers it really shouldn’t. Besides, with a love of a given genre and a little homework, the written word knows no bounds. The fortuitously named Dave West writes like he was born in a covered wagon, bumping and rolling along toward a new life in the western frontier. The lingo has all of the rhythms and catches that you’d expect, and West’s dialogue carries the attitude of the sand worn drifter with a checkered past that is Josiah Black. Once you get into the meat of the opening entry in the WesterNoir anthology, a story titled “The Woman With the Dead Eyes”, it’s easy to be pulled into a setting that’s very familiar, but ends up on a darker path than the squinty-eyed cigarillo smoking “man with no name” ever rode. The setting is further established in the artwork by the very talented Gary Crutchley. His black and white illustrations cement the look and feel of the story in a time and place not so very far back in time but still altogether removed from our current world. 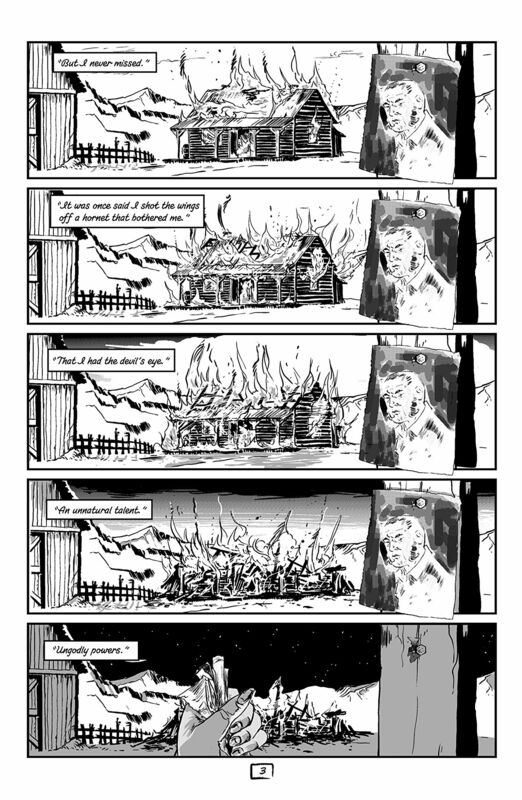 His panels are laid out to give the story a grim tone right from the opening pages, presented in a first-person perspective that follows a trail of bodies, Greta Anderson’s murdered family, and ends at their burning homestead. 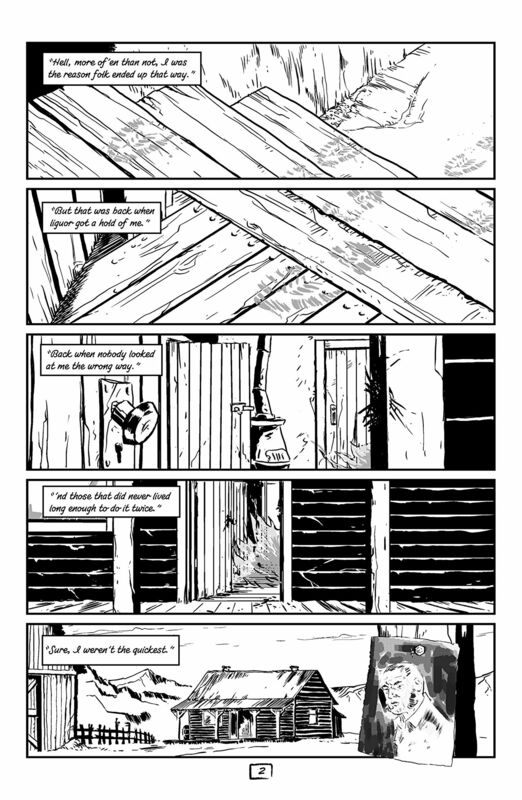 Crutchley uses perspective extremely well, taking odd angles and framing his panels to great effect. On the very first page of the story, we’re given an extreme close up on the eye of a body, the silhouette of the killer reflected in its surface. 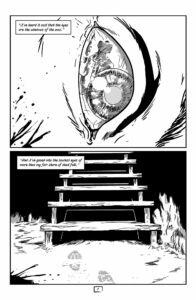 The panel’s narration reminds the reader of the adage, “eyes are the windows of the soul,” and we’re left wondering at the final thought of this particular victim. The overall theme that’s established early on in this anthology is one of a downward spiral as Josiah Black is dragged into the darker world that exists beneath the one we thought we knew. I haven’t finished this collected volume yet, and I already know that I’ll be continuing on with this series. If you were a fan of The Sixth Gun, or any of the other references I’ve mentioned in this review, you might wanna give WesterNoir a good look. Now I have to add that I’m having trouble finding where this book is available to us here in the states… Normally, I might’ve given up and moved on to the next review, but in this case I can’t. Seriously, I love this book. 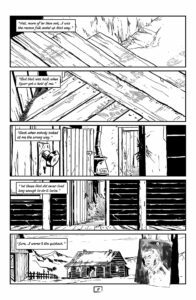 As of right now, all I can find is the first issue, available through ComiXology. I am going to keep looking, and if I find something I’ll be sure to update this article. WesterNoir is a great story, and I’m determined to show it the love it deserves.